Two years ago, in a Shaker Thumbs thread, I gave a thumbs-up to a gravity water bowl, which was a fixture in our house for a long time. Awhile ago, the connecting piece of the jug broke, so we tossed that and just kept using the bowl part, which now has a hole where the jug used to screw in. 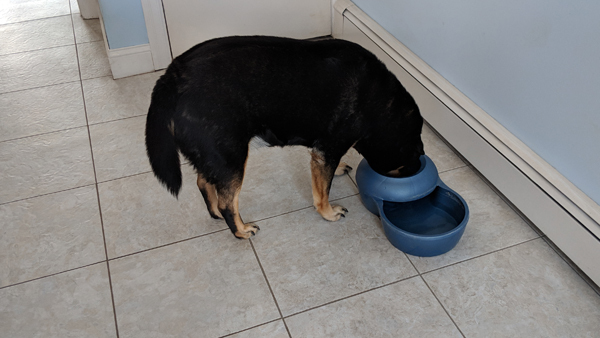 If, after refilling the bowl, it's placed perpendicular to the wall, with the bowl part sticking outward, Zelda will drink out of the bowl, as always. If, however, it's placed parallel to the wall (as Iain has a habit of doing absentmindedly), Zelda will stick her muzzle down through the hole and lap the water that way. She is such a wickedly smart dog that she figures we must have put the bowl a different way for a reason, and such an obedient dog that she assumes we must want her to do something different, and this is the conclusion to which she's come.